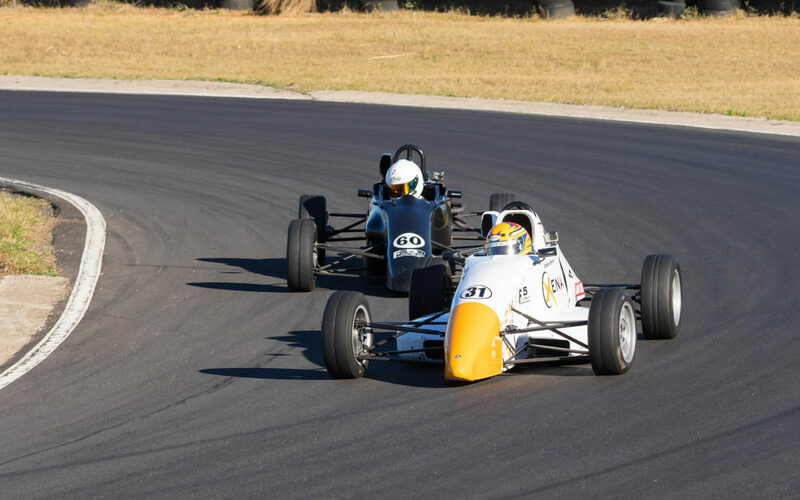 After a trip down to the coast in August, the Investchem Formula Ford Kent drivers return inland for the fifth round of the 2018 championship which takes place at Zwartkops Raceway on Saturday, 29 September. Andrew Horne (Xena Chemicals / Budd Power van Diemen), who is aiming for his fourth title, leads the championship standings by 13 points. Horne had a perfect outing last time out, winning both races and claiming the bonus points on offer for pole position and the fastest race lap. He will be out to repeat that at Zwartkops but David Jermy (Beauty Factory van Diemen), who followed Horne home in both races at Dezzi Raceway, will be looking to close the gap. Defending champion Dean Venter (TEU Southern Africa Swift) has had mixed fortunes this season but is still in third place on the championship log, 12 points behind Jermy. Alex Vos (Ecurie Zoo Swift) scored two podium finishes last time out to move up into fourth place in the championship standings. It is surely only a matter of time before the youngster takes his first Kent win. Jonathan Nash (Turnfab Engineering Swift), who had a disappointing outing at Dezzi and has dropped behind Vos in the standings, will be aiming to get back up the field and challenge for podium positions as he has done for most of the year. Jeff Gable (Beauty Factory van Diemen) currently occupies sixth on the table but he won’t be adding to his points tally after a huge crash at Kyalami in a Formula 1600 car brought a premature end to his racing season. Former champion Graham Hepburn (Suburban Body Shop van Diemen) makes a welcome return to the series at Zwartkops and he is certainly capable of upsetting the established running order at the head of the field. Others who will be out to grab as many points as possible around the 2.4k circuit include James Reeves (Ray), Steve Venter (TEU Southern Africa Swift) and Dalan Holton (Debella Finance van Diemen). Paul Gerber (Pablo Clark Ray), who has shown real pace in a couple of races this year, and Paul Manegold (Tiga) will also be on the grid. As usual, Friday will be dedicated to practice sessions with the 10-minute qualifying session getting underway at 09h00 on Saturday. Both races will be contested over eight laps, with the first one scheduled to get underway at 12h25. Race 2 should start at 16h10.